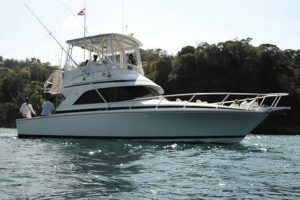 This powerful 36-foot Hatteras out of Pez Vela Marina in Quepos is powered by twin 500HP Yanmar inboard diesels. The boat was completely overhauled in 2018. Experienced and fully bilingual “Captain Mikael” Is at the helm. She has a new A/C salon; full head and shower; fish finder, VHF marine radio and digital depth sounder; GPS, outriggers, and all the USCG-required safety equipment, everything up to date. Equipment includes a complete range of international tournament-class heavy and light tackle. The boat will also do overnighters to the FADs on request.